"Hanging out with people just like me is such a confidence booster," Talbot Kennedy says about the rugby team. Watch for Health Minute on HLN. 10 a.m. - 6 p.m. ET weekdays. 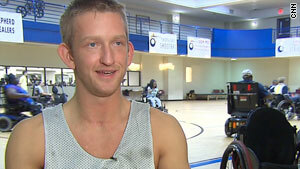 Atlanta, Georgia (CNN) -- Talbot Kennedy became a quadriplegic on the last day of high school. He's still an athlete. Playing rugby has helped Kennedy come to terms with his injury and his new life using a wheelchair. "I've always been active in sports, and being on a sports team, it's almost like you're part of a family," he says. "It's your second family." The Smash Rugby team at the Shepherd Center, a rehabilitation hospital in Atlanta, Georgia, scrimmages several nights a week on an indoor basketball court. "Take a hit Talbot," says coach and occupational therapist Amy Bohn. The team is part of the United States Quad Rugby Association, playing in tournaments across the country from November through April. "They learn to live again, and learn to live in a different way but realize that there's life after their injury, they can do all the things they did before." "I got hurt jumping on a trampoline," says Kennedy, now 24. "We were in the cheerleading gym ... and I was all ready to go celebrate graduating from high school ... and I remembered I'd seen my friend try this trick." But Kennedy landed on his head, damaging the vertebra in his upper neck. He was paralyzed from the chest down. Entering college on the cheerleading scholarship he'd won was no longer an option. "When I first got hurt I was worried about would I ever be able to live by myself or do other things that I wanted to do," says Kennedy. Then during rehab at Shepherd, he saw a wheelchair rugby match. "When I found wheelchair rugby and I realized you're out here working hard and hitting people, that made it all the better." So he joined the team and found out that his teammates led fairly normal lives: Some lived by themselves. Others had families. Some even had children. "Hanging out with people just like me is such a confidence booster," he says. Team camaraderie helps players realize they're not alone, Bohn says. "When they come out here they see that their teammates are strong and they are independent, and it gives them hope of what they can achieve and what they can do." Kennedy, who's been playing rugby for three years, is now one of the team's leaders. And he can tell you that this sport is not for sissies. Kennedy remembers the first time he turned over in his chair after a hard collision with another player. "I was pretty excited about it. I had been wanting to fall. I'd seen all these other people fall, and then it was like -- I'm a part of the team now, I'm part of something," Kennedy says with a smile. This full-contact sport provides an important competitive outlet. Many like Kennedy were also athletes before they got hurt. Instead of using their feet and a soccer ball, these men and women use their hands to throw, catch or dribble a volleyball. "The benefit for these guys physically is that it allows them to have a cardiovascular workout. They have to push hard. They have to strengthen ... and just get overall stronger so it allows them to be more independent in their activities of daily living," says Bohn. It also helps give them the confidence to venture out and try new things. "They learn to live again, and learn to live in a different way but realize that there's life after their injury, they can do all the things they did before," she says. Off the court, Kennedy lives alone, attends college and is working toward a degree in physical education, something he says would not have been possible without wheelchair rugby. "You get so much confidence in yourself doing this. ... It's a wonderful sport," he says, smiling. "I don't know where I'd be without it."